Ithaca, NY; April 11, 2018. 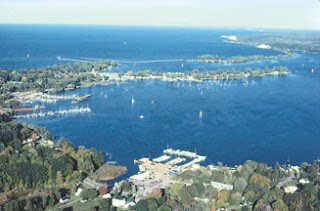 May 1 is the deadline to apply for the new round of grants available for Great Lakes ecosystem-based management projects through the New York Great Lakes Basin Small Grants Program. A total of $200,000 is available; up to $25,000 is available per project. Enhancing recreation and tourism opportunities that capitalize on the rivers and lakes, scenic beauty, and natural and cultural resources that define the character of the Great Lakes-St. Lawrence region is a new focus area for the grants administered by New York Sea Grant in partnership with New York State Department of Environmental Conservation (DEC). Not-for-profit organizations, county and local government or public agencies, municipalities, regional planning and environmental commissions, and educational institutions, including, but not limited to, public and private K-12 schools, colleges, and universities are eligible to apply. Application instructions are online at www.nyseagrant.org. Proposals must be submitted by 4:30 p.m. EST on May 1, 2018. For more information, contact New York Sea Grant at 315-312-3042. The New York Great Lakes Basin Small Grants Program is funded through the New York State Environmental Protection Fund and Article 14 of Environmental Conservation Law. 0 Comments to "May 1 Deadline to Apply for Great Lakes grants: Recreation and Tourism New Focus Areas"